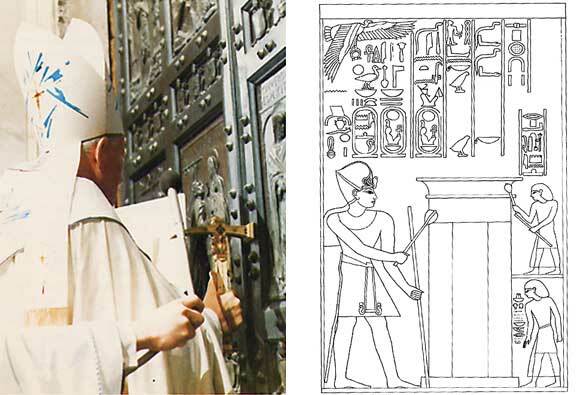 One of the more interesting rites that has been practiced throughout time is one where a high priest knocks on a holy door or gate three times with a hammer, mallet, or mace before opening and entering. What the inside of an LDS (Mormon) temple looks like is not a secret. Before the dedication of each new temple, they are opened up to the public in a several week-long open house. Many thousands of people are freely allowed inside to see the different rooms and feel the Spirit of the Lord that resides there. Pictures of the outside and inside are published by the Church. Then the building is closed to the public and is dedicated to the Lord and set apart for the work of performing gospel ordinances for the salvation of the living and the dead, the Atonement of Jesus Christ making it all possible. See a short video inside the newest temple of the Church in Rexburg, Idaho, compiled from published photographs from the LDS Church. The experiential, ritual, ethical and legal, and material dimensions of Mormonism all have one thing in common: relatively little attention has been paid to them. These elements need to be integrated with other dimensions of the faith and compared with like characteristics in other religions before the tradition’s structural makeup is fully portrayed. What it means to be a Latter-day Saint is reflected in the experiential and ritual dimensions of the faith every bit as much as in what adherents believe or in the sacred writings they hold dear . . . the study of the ritual or ceremonial dimension of Mormonism, in everyday life and worship, is of vital importance in gaining a better appreciation of the tradition as a whole. This aspect also needs to be studied in comparison with patterned celebrations and formalities manifested in other traditions.